I love a holiday, I love festivities and I am a fan of traditions, old and new. 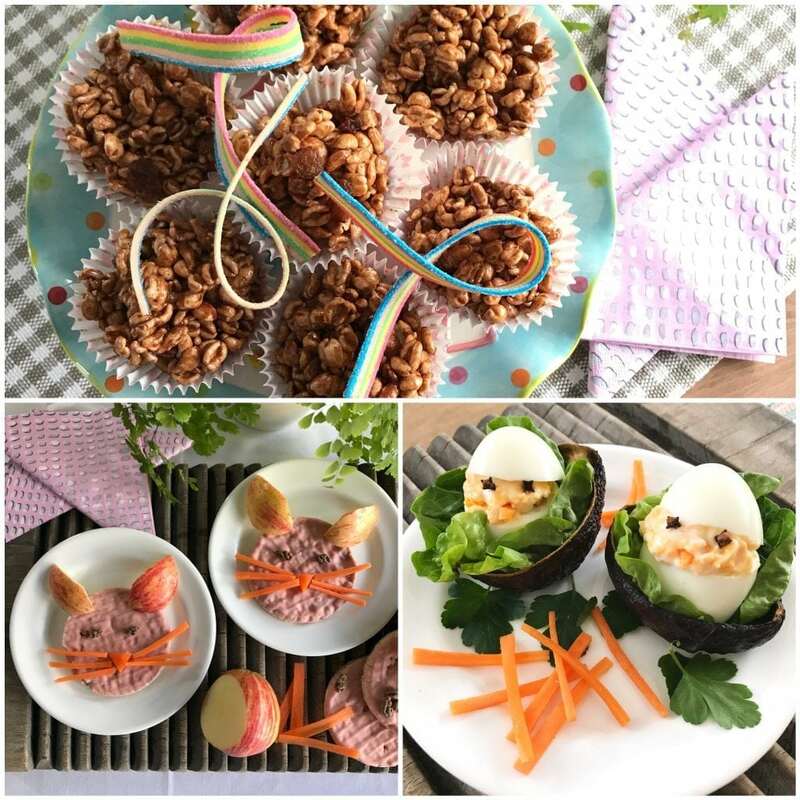 Easter egg hunts, easter nests and chocolate eggs are a must but I was also wondering if I can add some healthier easter snacks to add the array of the childrens usual favourites? What comes with a holiday is a different routine. The kids being at home means loud and full-on family days and I love hanging out with family and friends. Our house is always filled with people. Our kitchen table full with yummy foods. Stressed about too much chocolate? The times where I worried about ‘too much this’ and ‘too much that’ are long gone. During our holidays life is different. We do different things and we eat differently too. And that’s that. Just because the children have more chocolate does not mean that the rest of their meals are equally less healthy. No, quite the opposite is happening for us, which is the reason why I don’t mind the sugary snacks so much. I’ll always remember what Catherine Lippe, paediatric nutritionist, told me in an interview a while ago. That we as parents are in control over when we have family meals and what gets eaten. And we allow the children to trust their gut over how much they want to eat. Chocolate is bound to be part of your Easter celebrations and we should never feel guilty about allowing ourselves or our children to eat it. The key is not to make it the ONLY part of the celebration. Bringing a variety of foods into your festivities encourages the idea that variety is always important, even at times of celebration. This helps to promote the idea that all foods are equal and all foods can be fun. Games, songs and Easter themed arts and crafts are also a really important part of the festivities. Why not have a go at egg shell painting, bunny hop races, egg rolling, and egg and spoon races too? Of course, sometimes these things are outside of our control so if family and friends are offering the kids lots of chocolates or Easter eggs is best to roll with it and avoid saying no. Research shows that restricting or forbidding foods can actually make them more desirable. 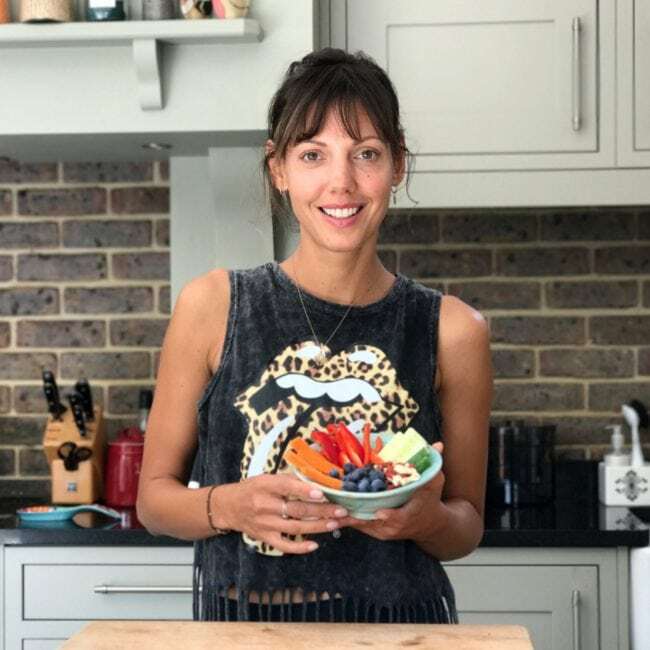 Instead allow your child to enjoy these foods whilst they are available and focus on offering other foods later that day to bring about a the all importance balance. So I make sure that we have an extra portion of raw veg with our breakfast (like cut up bell peppers or cucumber are always gone within a minute) , a wholesome lunch and tea and in the meantime the children can indulge in their many chocolate eggs. I want them to feel that they are not missing out at all but equally I want to feel that I am still doing my job at providing them with a good diet that allows them to grow into healthy adults. 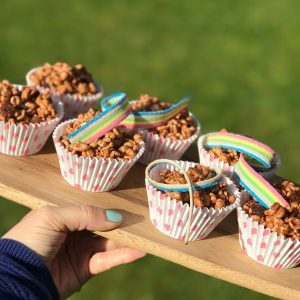 And when the days with the children being off school seem rather long (some feel like they’re 48 hours long, others just fly by) and I don’t mind a bit of extra mess (I’m lying as I do mind), I get the kids involved and we make some fun and healthier eastersnacks together. Spelt puffs alone taste a bit ‘nothingy’ but covered in a mixture of dark chocolate with honey these make really great snacks. Use 95g of dark chocolate, gently melt in a pan with 1 tbsp (or milk of your choice) of water over very low heat. Once runny, add 1 tbsp of honey to take the edge off the bitter taste of the chocolate. Pour over about 100g of spelt puffs and mix well. Place into your muffin cases and place something really yummy on top to decorate. A chocolate Easter egg works well for example. 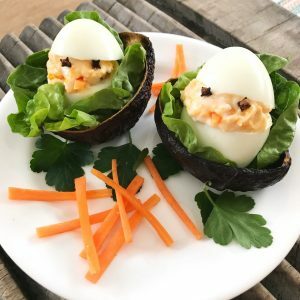 These are so simple to make but look so sweet and I love a hard boiled egg as a snack at any time during the day. Simply hard boil your eggs and allow to cool once cooked. Cap the top and remove the yolk. In a little bowl, mix the yolk with some mayonnaise, a sprinkle of salt and then transfer back into the egg. Pop the lid back on, find something to make eyes with and cut up bits of carrots for a little beak. Voila. Happy Easter to you all! Enjoy your families, enjoy your chocolates and a carrot in between. Den Kindern werden die österreichischen Schoko-Osterhasen bei Oma und Opa bestimmt gut schmecken.